The fundamental liberties in our Constitution involve a study of tensions: between an individual's rights and the community's interests, between the role of the judiciary on the one hand and the executive and legislature on the other. How we should interpret them depends on where we think equilibrium should be established. This depends on two main factors. 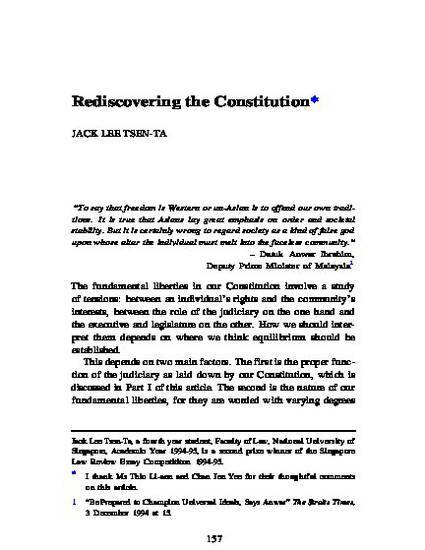 The first is the proper function of the judiciary as laid down by our Constitution, which is discussed in Part I of this article. The second is the nature of our fundamental liberties, for they are worded with varying degrees of generality. ... Part II looks at two general approaches to constitutional interpretation and explains why one of them – moderate textualism – should be adopted by the courts. Finally, Part III illustrates moderate textualism in action by proposing a reinterpretation of Art 9(1) of the Constitution. This is the thrust of the article: our judges, charged by the supreme law of the land with responsibility to interpret our fundamental liberties freely where such freedom is due, must rediscover their proper constitutional role.